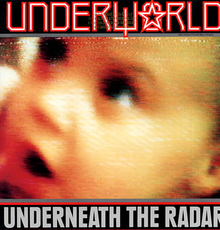 After Freur disbanded in 1986, Karl Hyde and Rick Smith formed the band Underworld which tried a more guitar-oriented funky electropop sound. The band signed to Sire records and released the album “Underneath The Radar” in 1988. The title track of the album was released on Sire 12″ single and Promo CD, it was featured prominently in the fifth season premiere of Miami Vice, during the opening aerial shots of Miami and subsequent nightclub shootout. On the singles charts, it reached number 9 in Australia, number 2 in South Africa, number 14 in New Zealand and number 74 in the United States. The 12″ Shep Pettibone Remix has been made available on CD on the Sire Promo CD and in 2005 on Retro:Active4 – Rare And Remixed, this series of compilations comes very highly recommended, the Dub Version by Shep Pettibone has never made it to CD.